When to plant -- Plant your seeds immediately for the best germination. Getting started -- These seeds sprout well by soaking them in water (see: Sprouting seeds in water). To begin, put them in a small cup of water, and place it in a spot that will stay between 65 and 78 degrees F (18-26° C). A bit cooler at night is ok. Avoid letting them get above 80 degrees F (27°C) for prolonged periods. I recommend placing a minimum/maximum thermometer near the cup. Keep it in a bright spot out of direct sun. A bright LED or fluorescent bulb kept 3 inches (8 cm) away provides the right amount of light (See: "Growing indoors with LED lights"). Replace the water every 1-2 days. They should start sprouting within 2-4 weeks, and continue for another month. Carefully remove any seeds with a little white root. Plant them in small pots or cups with drainage holes. Use a well-draining soil mix, such as half potting soil and half perlite. An alternate mix is 2 parts perlite to 1 part coir fiber. Gently press the seed into the soil until the root is covered, then add water until the soil is evenly moist (but not fully saturated). If the seed is showing, sprinkle a small amount of soil around it. Until the first leaf appears, ensure that the soil surface doesn't dry out. If you enclose the pots in a plastic dome or bag to maintain moisture, leave it open slightly for some fresh air to enter. Continue keeping them in a bright spot at the temperature range mentioned earlier. Once they send up their first leaf, about a month later, you may give them some direct sun if you wish, but protect them from strong sun the first 3 months. The young leaves will lack spots becuase the light isn't strong, but this is normal. When they are 1 week, give weekly feedings with a small amount of diluted liquid fertilizer (about 1/8 strength). Hydroponic fertilizer is ideal for young seedlings, since it is easily absorbed and complete. When they are 3 months old, you may switch to a granular fertilizer. Choose one that contains micronutrients. After they are 3-4 months old, you can repot to a larger pot. Transplant gently to avoid damaging the roots. When repotting, bury them a 1/2 inch (1.5 cm) deeper, and repeat this the next time you repot. At 4 months old, you can expose them to a wider temperature range, but protect them from freezing temperatures the first year or 2. 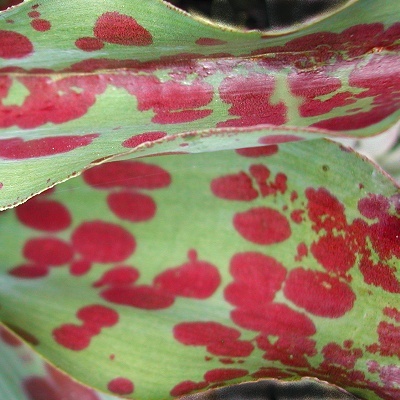 The leaves will eventually develop spots if given several hours of sun per day.